Guangzhou(Canton), Canton fair held in Guangzhou China, near Hong Kong. 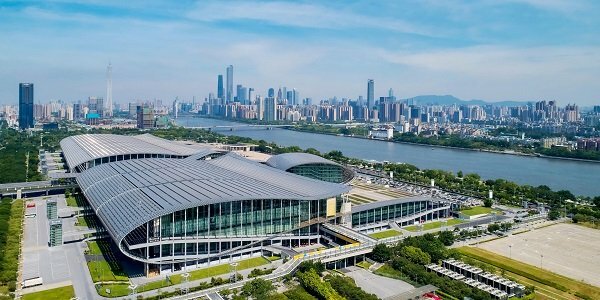 The word 'Canton' of Canton Fair is another name of the Guangzhou city China. 'Guangzhou' is the pronunciation of Mandarin. 'Canton' is the pronunciation of Cantonese. The business card is really really important to visit Canto fair. First, you need it to register and get the badge. Second, if you need some product catalog, they will ask for a business card. In some extreme situation, you cannot even enter a booth without giving your business card to the vendor first. Business card essential thing to do business in China. Politely, everyone will also prepare a beautiful little box to receive the business card, instead of putting it directly into the bag or pocket. You can make your business online very easy(search google). If you forget to bring your business card, outside the Canton fair, many people can help you make. In 1 hour you can get them. Certainly! You should go to Canton Fair. Then you will know the products what you think can't be better quality can be much better, what you think can't be cheaper can be much cheaper! Also you can find a lot of suppliers, contains a wide range of the latest products. In recent years, there has been no lack of "B2B Online will replace all" and the like. People all over the world access the Internet and more, to raise such questions and then normal. By the survey of very many guests who participated in the Canton Fair. We are sure to tell you it is worth to spend money to spend the time to attend the real exhibition show for the following reasons. As a matter of fact, the majority of manufacturers all over the world, they are not very skilled use of Internet promotion. Their latest products would be starting at the real exhibition shows, when appearing on the internet, is basically a year latter; There are many industries can not be described and communicated through the internet, it must personally feel and touch, the Internet and then a detailed description of the content, can not make a business decision. The manufactures attend exhibition will very costly to spend the time to spend energy, from the frequency of exhibitors and booth size and the quality of field personnel, especially model quality. Professionals are able to deduce a lot of information from the details in the exhibition; And vice versa, let's imagine the communication costs if manufacturers spend money to make a website to sell products, received at least 99% of the intention information is noise, screening costs are too high; For example, Canton Fair is the highest threshold of one of the exhibition, mainland residents to try to attend more difficult than applying for a US visa, will you receive any spam? The exhibition is also a chance for the world to know you personally. As we know, making friends is an important part of doing business successfully. Canton Fair will be twice a year. It will be Spring session and Autumn Session. Each session has 3 phase. Is there a dress code in the Canton fair? No. There is no dress code in the Canton fair. No. There is no dress code in the Canton fair. You can go to the First AID office to ask for one, only 10 wheelchair, for who really need it, 500RMB as the deposit. Providing medical cares service to the participants, buyers, exhibition staff and other persons. Lost badge, the only need to do is go to the registration office personally, 200RMB have to pay to get a new one. 2. Left Luggage Office is served for all visitors,exhibitors and overseas buyers,and only accepts deposit of travel bags, trunks, backpacks, handbags or suitcases in good shape or good outer packing. Empty luggage or luggage with carton outer packing is not accepted. a)Large (65cm*43.8cm*85cm,for 28-32 inch suitcase): 25 RMB / piece. b)Medium (47cm*43.8cm*85cm,for 22-26 inch suitcase): 15RMB/ piece. c)Small (33.5cm*43.8cm*85cm,for 20 inch suitcase): 10RMB/ piece. The automatic deposit lockers can accept We-chat Pay,Ali Pay and RMB cash, only RMB cash can be accepted by luggage rack. 4. The Left Luggage Office does not provide 24-hour service in principle. All deposited luggage shall be claimed before 5:30 pm of the day. 5.In case the luggage deposited remains unclaimed for 3 days after the Canton Fair is closed, it will be handed over to the department concerned. Outside the canton fair, there is a lot of student holding the banner interpreter. But we suggest the office Canton Fair interpretation Service Center. Which is located on the 2nd floor of both Overseas Buyers' Registration Office in Area A & Area B of the Fair Complex, provides multilingual interpretation service for buyers and exhibitors. That will save you time to make their badge. 1. Is it your first time to visit this Show or first time to visit China? 2. How many years your company do this business? 3. Have your company done your customized gift-box, developed your unique private mould products with Chinese supplier? 4. What is your main sales channel, online sale as distributor or have shops? Do retail business or wholesale? 5. What is your average purchase order amount every month from China? 6. We warmly welcome your visit our factory, do you have time? 8. What is your market best seller ? 1. Are you factory or trading? 2. Why I should choose your company, I never heard your company before. 3. We buy from supplier A. what is the difference between your company with supplier A? 4. Do you have all certification? 5. How can I get price? 6. MOQ and sample order? 7. Which country do you already have distributor? 8. Can I use our private packaging, our logo on your products? 9. I have 3D drawings, can your company produce? 10. Which is new products, which is best seller? In order to appropriately handle the issues and complaints relating to intellectual property rights and contract disputes within the exhibition halls during Canton Fair period, and to maintain the good image and reputation of Canton Fair, reception stations for intellectual property rights, product quality and safety and trade disputes are established at Canton Fair, to deal with the complaints from the foreign buyers and the foreign exhibitors attending Canton Fair. The complaint reception stations are under the direct leadership of the Business Office of Canton Fair. 3. Assistance in the handling of other relevant complaints. China Import and Export Fair, or Canton Fair for short, is held twice a year, in every Spring and Autumn, i.e. in April & October. During the opening period, the Fair will be open from 9:30 to 18:00 and will go on the weekends. If he/ she has the Chinese passport with an overseas employment visa valid for over one year or Overseas Permanent Residence Permit? Then she/he can get the badge at the Canton Fair complex with the companion of the Overseas Buyers, the personal valid document (the origin and copy of the second generation ID card ) , Identification Photo (5cmX10cm ) in white or blue background, and the personal business card. It will cost his/her 300RMB/day/person and another 50RMB for the cost of the fee.